Today's the last day we have kiddos visiting home. In fact, it won't even be a whole day (boo, big thumbs down). The last one heads to the airport today. My oldest and his family left yesterday afternoon. The visit was longer than usual, but never long enough. I do love my babies home and together (and in saying babies, I mean all of our kids, even the grown ones who are certainly not babies). My second oldest and youngest going downhill on a saucer. 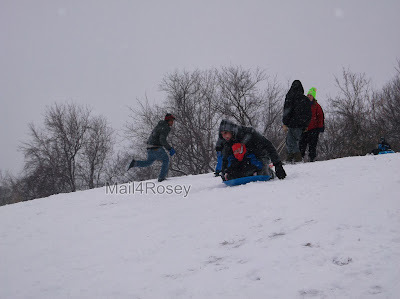 A couple of days ago we went to town to sled down the big hill. It took about 20 minutes to get everyone dressed, and about one minute for the baby to decide she wasn't going sledding. 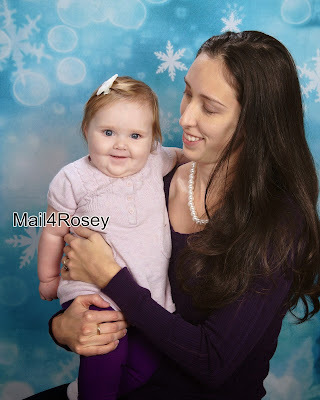 We all laughed, but awwww to the little one who was not down with the cold weather, not even bundled up like an eskimo. 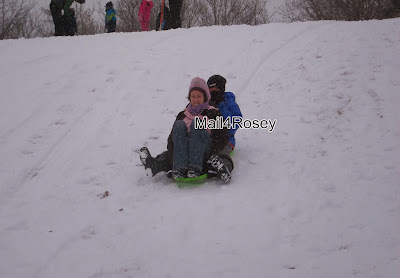 :) Good thing for the older kids that we went that day, it was ELEVEN DEGREES BELOW ZERO the next day!! His oldest brother and wife put window markers in his Christmas stocking. 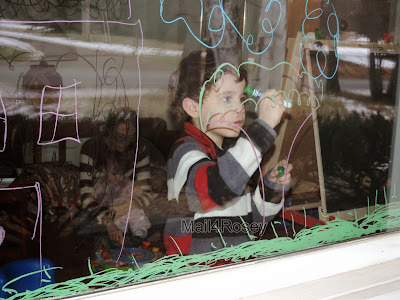 We spent a lot of time just hanging out, talking, eating, checking out the youngest two's new Christmas presents (including the window markers above), & playing games. Nothing big or out of the ordinary, but all very, very nice. And now for us, the holiday is officially over. It was a really great one, and though I love that my grown children are responsible and have healthy, happy lives of their own, I hate, Hate, HATE to see them go. Back to the grindstone on Monday (school, work, etc.). :) Wishing everyone a very happy weekend. Very nice family pictures. I call all mine babies, too. My oldest is 22. Awww lovely photos! What a nice family you have, sounds like a loving one! That little baby, oh my precious! Just adorable. Love all the pictures Rosey! You have a beautiful and loving family! Happy new year my friend! I know I haven't been a very good one lately and I can't apologize enough for that! My end of 2013 couldn't have been more dramatic, felt like an episode of Days of Our Lives-Mystery Diagnosis and Untold Stories of the ER all in one!!!! LOL...the guys did a lot of Dinners Drive In and Dives and I was really getting ready to Snapped!!! !LOL I hope this year is better. Big Hug, Congrats on your new Camera!!!! that is awesome, I'm expecting to see YOU in one of those family portraits. Oh no, Lizy, I'm sorry to hear your year ended on not so good notes!! It doesn't sound fun at all!!! 2014 is going to bring good change!! Looks like you had a great holiday with you family. What a lovely family too. That rocks. Thanks, Sandee. We've got a big snow storm coming in, so they all filed out just in time, I think!! Happy weekend to you too!! The house is so quiet today! I know it was amazing to have them all together and I am so happy you had great time with them. 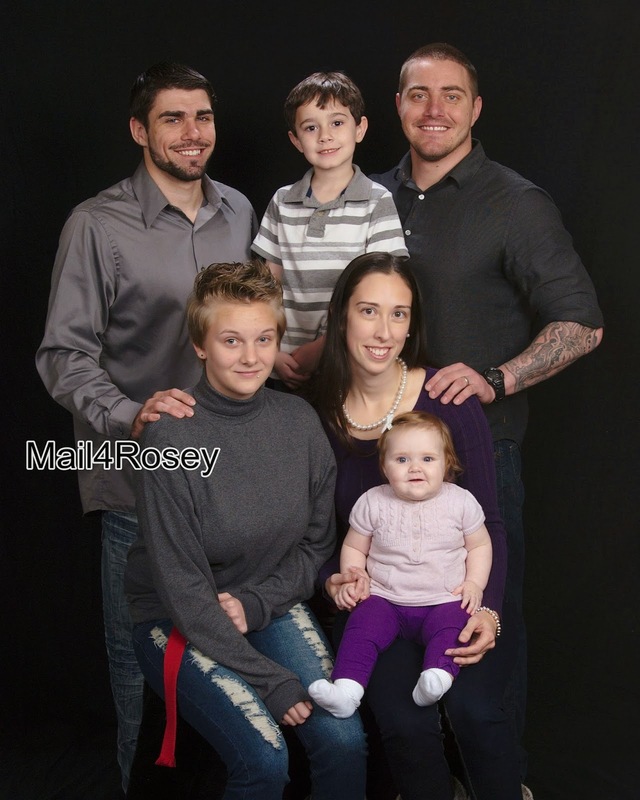 I LOVE the family photos. Oh, and it's 9 below here today. Brrrrr. So glad you guys had such a great visit! You and your husband need to go out and see a movie to combat the "they've all gone home" blues! Happy New Year! Wishing you a happy 2014 too, Melissa! 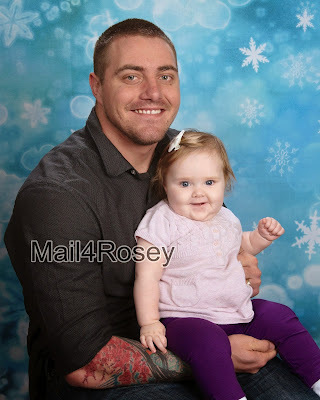 Your granddaughter is so adorable and her smile is just sweet! I bet you will miss all of your kids. The pictures were really nice that you shared! Too bad it is so cold out!! Thank you, Karen. That baby is so so so sweet!!! How nice for you that you got to have all the kids together. I bet you were in your glory. That was a perfect Christmas gift. I feel your pain about children coming for a visit and then taking off. My son left last week and the middle daughter was supposed to leave on Sunday. She pushed the drive home back because of the predicted snowstorm. My baby will be around for a little while because she is studying abroad this semester and Australian schools don't start until half past February. Oh, I want those window markers! I'm glad you had a good visit. It does go too fast. Everyone is home safe and sound now. I'm glad for it because there's a blizzard heading in tonight possibly. They've declared an upcoming emergency weather status in the town and warned people off the roads, with no public street parking. Looks like a doozey of a storm's coming. Isn't it great to have all the chicks back in the nest? It looks like you had a fabulous time, but I'm with your grandbaby... those temperatures are a little (LOT!) too cold for my blood, too. Great pics. Our oldest gave us a gorgeous family portrait of him and his wife and four kids, too. LOVE it! What awesome photos! I love how your granddaughter is looking right at the camera with biggest, brightest smile --so adorable!! Yeah it was about 10 below zero here two days ago. I hope this cold snap is over soon. Our chickens are really being put to the test. (So far so good.) Stay warm and Happy New Year! She's so sweet, she just smiles for every single person that smiles at her. Just a little doll baby. :) Happy new year to you too, and good luck w/the chickens!! Wonderful photos! My kids are still small, but I love having them home for the holidays. I'm always sad when school starts again. What a beautiful family you have, I love the pictures! You must have had a very full house during the holidays :) My oldest has been out of school for winter break forever it seems thanks to snow days. Not sure if he will return tomorrow or not because we are due for another storm tonight! 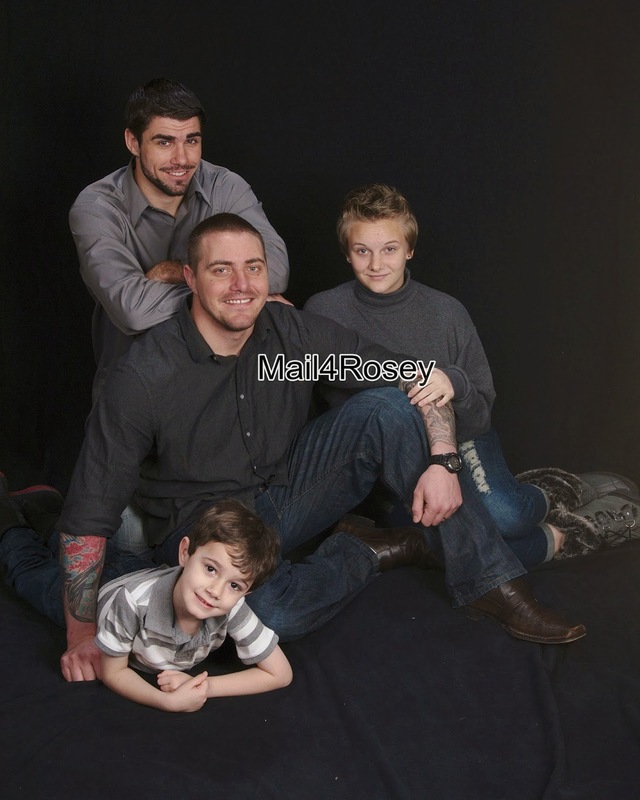 So glad you got family pics done too... they are great!!!! Sweet. Love the pictures. You can't go wrong with pictures of any kind to grandparents! ;-) Happy New Year Rosey! You have such a beautiful family I'm glad you had a lovely visit. Gorgeous pictures I'm sure you'll treasure. The photo package was a great gift! Everyone looks great in them. Isaak has those window markers. They keep him occupied for awhile. Those markers are really cool! I love the idea of a prepaid photo package! What a thoughtful gift! That's awesome that you have kids that so in tune to what you would love! I adore the photos. Smoochie baby girl for me...well when you touch her again. Isn't she just a delight. I remember when mine had those cheeks! Glad you had such a good time with the loves. Family time is the best and it looks like you had a great time together with yours. The professional pics turned out wonderfully. Thanks, Terra. We did have a really nice visit.